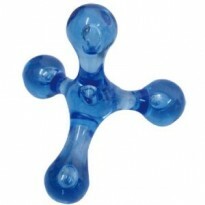 Knobble-it 4 ways can be used directly on the skin. It can also be used over clothing, which allows for light or intense massage. - Large circular movements, you can gain a gentle massage. - Using 3 of the 4 heads, and for a deeper massage.